DFO must assess ALL research done on the impact of farm salmon on wild salmon and if found greater than minimal, the industry must be prohibited from operating on the Fraser sockeye migration route! 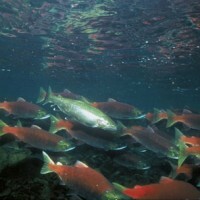 Siting criteria has to be revised to include wild salmon migration routes. As this report is tabled, you should know the Province of BC is in the process of renewing many salmon farm leases. The Province of BC remains the landlord of the industry even though regulation has become federal. If BC offers this industry long term leases, Justice Cohen's recommendations and our $26 million will be wasted. The Province cannot at this point offer these lease renewals without consulting with the Fraser First Nations, because the salmon they have rights to are swimming through effluent from the salmon farms, Cohen is specifically reporting on. I am actively researching exotic salmon viruses, but if these leases are renewed in the next few weeks, there will be little chance of the Cohen recommendations being acted on. This report is the result of a massive amount of work, I especially thank my lawyers Lisa Glowacki and Greg McDade - they went the extra mile and beyond! There is something you can do now. I have created a petition in honour of Cohen's work asking Permier Clark not to renew the salmon farm leases to the sea floor of BC. If you step up and share it widely, there is a chance our children will have wild salmon in their lives, and honestly it looks like there are tough times ahead, they will need everything we can leave them. A report from Delta Staff on the correspondence received up to March 7, 2011 shows clear majority support for an application to return the Southlands to the Agricultural Land Reserve (ALR). For Delta residents, 985 have indicated support for the ALR application while only 501 have indicated opposition. For those outside of Delta, 441 have indicated support for the ALR application while only 22 have indicated opposition. The Gulf oil spill is a wake up call for all of us. The public is quick to point blame at British Petroleum. BP is partly to blame but so are we. It is our demand for oil that drives oil tankers into harbour cities. BP is responding to our thirst for oil. A new 13 min documentary - produced by filmmaker Damien Gillis in partnership with a number of Tsawwassen groups and citizens - is now available online. "Saving the Southlands" tells the story of the 30-year battle to protect a 500-acre parcel of prime farmland in Tsawwassen from housing development - set against the backdrop of an emerging food security crisis in BC. Liberal leadership candidate Mike de Jong, Dawn Black of the NDP and Jane Sterk of the Green Party were the only ones answering the one question poll: all three answered “yes.” All other Liberal leadership candidates and the Reform Party leader did not respond to the online question. Cosmetic pesticides are pesticides (e.g., synthetic weedkiller) used for the purposes of enhancing the appearance of lawns, gardens, public parks and recreational facilities. Scientific studies show that chemical pesticides are increasingly linked to serious illness, especially leukemia, non-Hodgkins lymphoma, cancer, birth defects, learning disabilities, and fertility and neurological problems. Across Canada, over 170 municipalities, the provinces of Quebec, Ontario, New Brunswick, PEI, and soon Nova Scotia have enacted legislation to ban the sale, use and application of cosmetic pesticides. Group Hike on the South Fraser Witness Trail! The South Fraser Witness Trail follows the route of the proposed South Fraser Perimeter 'Road' freeway through an urban forest in Surrey. Named as one of the city's five major natural area hubs in a recent study, it is home to deer, beavers, herons, owls, salmon, and endangered species such as the Red legged frog and Pacific water shrew. Perimeter Road, in combination with related Gateway Projects such as the Delta Port expansion and Golden Ears Bridge. Eliza Olson, president of the Burns Bog Conservation Society, is one of ten finalists in CBC's Champions of Change contest. If she wins, Burns Bog will get $25,000 which would help pay for the lawsuit. If you haven't already, please go to CBC's Champions of Change and vote for Eliza. You can vote up to ten times, and can cast all of your votes today. I'd like to share my current thoughts on the use of the terms “climate change” and “global warming”. My comments are triggered after watching coverage of the excellent demonstration “Dig in for Climate Change” and while it appears to have been a great success, from my point of view, the use of the term, “climate change” distracted from the real issues of the South Fraser Perimeter Road. I'm concerned about the use of the terms “climate change” and “global warming” as it is my opinion that they are too broad in scope and are not good labels to consistently use. It is simple to call me a “climate change denier” and ignore this, however I request that you give me an opportunity to share my thoughts. I think debating the truth about “climate change” and “global warming” is a way of distracting people from looking at specific issues. People are being “sucked into” using these terms. It prevents people from examining the direct impact of actions and developments that are destroying the environment. To me, the worldwide loss of habitat is devastating. The loss of species, farmland, and natural environments along with the pollution of soil, air and water are critical issues. In some cases, the causes are change in climatic conditions and these should be specifically cited as caused by warming or cooling conditions. I suspect our governments, and “destroyers of the environment” like nothing better than to use “green rhetoric” to avoid the truth about what they are wilfully doing for power and money. They love to use the terms, “climate change”, “global warming”, “greenhouse gases”, “sustainability”, “alternate energy”, “green buildings”, “ecodensity”, “growth” and “balance”. It is my opinion that these terms have become green rubbish. It is important to avoid the rhetoric and point out the specific impacts of actions and developments that are destroying the environment. In the case of the South Fraser Perimeter Road, the Project will destroy some of Canada’s best farmland, habitat for species at risk, Burns Bog hydrology, transitional habitat, a highly-significant archaeological site and the quality of life. It will result in air pollution and over 50 kilometers of environmental degradation. Prince Charles who in a recent interview declared his aim is to be a “defender of nature…, makes a more accurate statement as to what our goals should be. The debate about “climate change” is ongoing. I am alarmed about the information that is coming out. It is so easy to use the terms as if they are the “cause” of all evil. I haven’t read anything that would help me use these terms with comfort and have a sense that I know what I am talking about. Using these labels is a lazy way of avoiding doing proper homework on the issues facing us and sidetracks the debate about the real issues of willful environmental destruction. I'd like you to consider the following article. It is articles like this that make me uncomfortable using terms that I know so little about. One can go on the internet and find excellent arguments on both sides of the debate. How many of us really know and understand the science? What we do know is that we need to continually speak up against deliberate environmental degradation. Harold Lewis is Emeritus Professor of Physics at the University of California, Santa Barbara. Here is his letter of resignation to Curtis G. Callan Jr, Princeton University, President of the American Physical Society.